'Sailing On The Seven Seas' was the first single taken from the album. The song came about when Andy was walking down the road and the Gary Glitter-esque drum rhythm came into his head. The track was apparently written and programmed in less than 45 minutes - an example of the speed at which much of the album was produced. The 'cheesy' organ solo in the song is from a Casio CZ230S and the track also features live guitar from Stuart Boyle (actually the only live instrument on the entire album). 'Pandora's Box' was inspired by silent movie star Louise Brooks. The song title refers to Brooks' most famous film Pandora's Box (1929). 'Then You Turn Away' was the third release from the album. 'Speed Of Light' was about how a relationship changes over time and draws comparisons with aspects of physics - such as the speed of light. Due to the speed at which the album was being recorded, there are some artefacts on the finished tracks, such as some mic distortion on the final fade of 'Was It Something I Said'. Big Town' is a metaphor for the music industry. 'Call My Name' was the fourth single taken from the album. 'Apollo XI' uses samples taken from the actual Apollo space missions. A special mix of the track was pressed up on white label 12" for clubs. 'Walking On Air' took its initial inspiration from the house that Andy was living in at the time which was over 500 years old. He thought about all the people who had lived there and imagined footsteps walking up the staircase. These spectral thoughts were translated into the song to suggest a ghost from someone's past. 'Walk Tall' was originally a song called 'Coming To See You'. It also uses a choral sample from 'Misere' by Allegri. 'Neon Lights' is a cover version of the song by Kraftwerk which originally featured on their 1978 album The Man Machine. 'All That Glitters' was a song that played on the idea of deception - to be taken in by something that appeared to be better than it actually was. 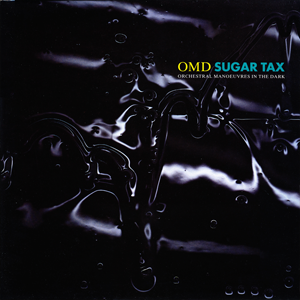 Sugar Tax was the first OMD album to emerge post-split (when Andy McCluskey and Paul Humphreys parted ways). The album saw Andy collaborating with Stuart Kershaw and Lloyd Massett for the first time in the writing of new material. Initially, Andy Richards was brought on board as a producer but ultimately Andy McCluskey decided to self-produce much of the material with the assistance of Jeremy Allom and Phil Coxon adopting engineering roles. The album was recorded at speed with many songs being recorded within a day of them being written. The sound of the album features extensive use of the Korg M1 Workstation. Many of the vocals are actually taken directly from the original demos as Andy considered them to be the best that he'd done at the time. The title Sugar Tax refers to everything sweet having a price, particularly in relationships. The actual track 'Sugar Tax', ironically, doesn't appear on the album due to it being unfinished prior to the release of the album. The sleeve design is actually an oil sculpture. Initial copies featured a stickered sleeve stating: "Includes 'Sailing On The Seven Seas' & 'Pandora's Box'". Initial copies of the vinyl release were misspressings. 'Apollo XI' had been replaced by 'All She Wants Is Everything' and 'Neon Lights' replaced by 'Apollo XI'. About 5,000 copies of the misspressing were released. Although there is no difference in the sleeve design or track listing, the matrix number imprinted on the record itself states 1U-1-2 instead of 2U-1-2 as featured on corrected later pressings. Due to the change of track listing, some of the credits on the album sleeve are actually incorrect. Carmen Daye sang the backing vocals on 'Speed Of Light', Doreen Edwards sang the backing vocals for 'All She Wants Is Everything', Sue Forshaw sang some backing vocals for 'Sailing On The Seven Seas' (but is almost undetectable in the mix). Stuart Kershaw and Natalie Loates don't actually appear on the album. Christine Mellor sang the backing vocals for 'Pandora's Box'. Ann Heston (Pink Museum secretary) provided the high chorus for 'Walk Tall'.